People often wonder what golf course workers do when it is raining. Well . . . it's been raining this April so I can answer that question! 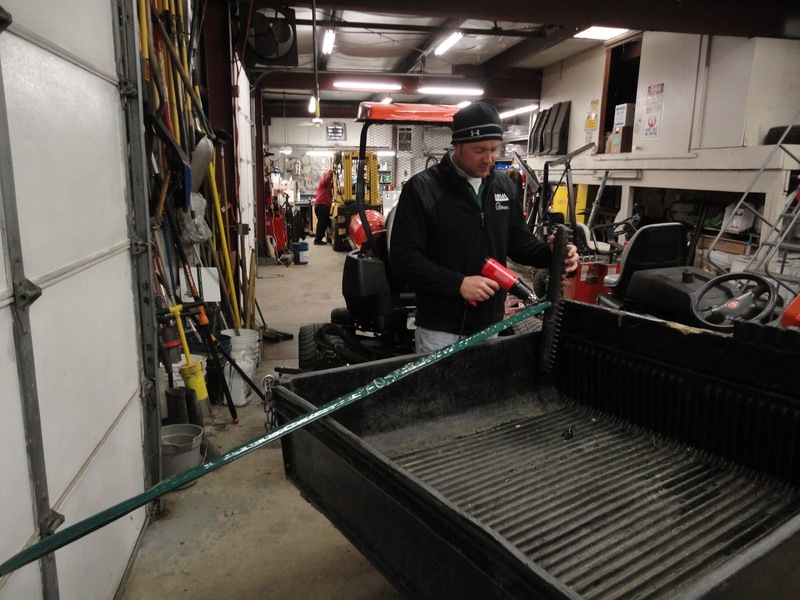 Rainy days actually serve an important function for a golf course crew. I always keep a couple "rain day" jobs on the back burner until there is a suitable day to get them done. In fact, if it never rained, I think I would have to create "virtual rain days" where the crew stays off the course and focusses on other projects. At the moment, the crew is helping me do an alpha sort and file of receipts and PO's from 2010. I meant to do it over the winter but, you know, didn't get around to it. Over time, fiberglass bunker rakes start to fade and splinter. They last longer than the old aluminum handles that would kink and bend, but nobody likes fiberglass splinters. Paint doesn't stick for long, so we decided to use a product called Vinyl Guard to refurbish the rakes. Vinyl Guard uses a heat shrrinking process to put a permanent protective coat on the handle. For a couple bucks per rake, they are like new. We are in the process of making some repairs to the irrigation pump system. Over the past week, we have been disassembling and inspecting all the components of the system. Most of the piping will be replaced due to its age and condition but some elements can be refurbished. Particularly interesting has been the "mystery of the bladder tank"! We have never been able to figure out the manufacturer or model number of our tank because there are no markings. We also weren't exactly sure if it was working properly or not (we suspected not). The red tank in the following pictures is supposed to hold an inflated air bladder that buffers system pressure and protects the pumps from excessive starts and stops. It is important to maintaining the system's health and longevity. Unfortunately, the air cavity was slowly leaking pressure and had been contaminated with water and sludge. 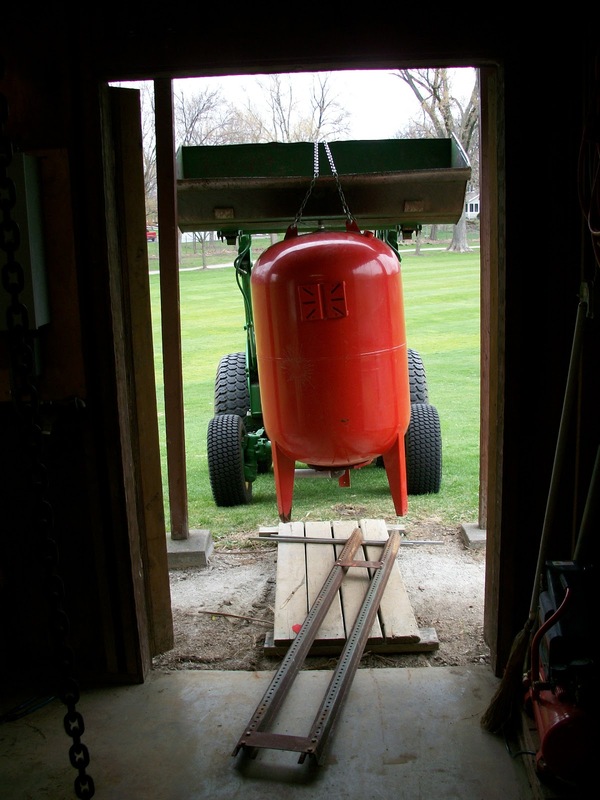 The tank weighed at least 800 pounds in its waterlogged state so our mechanic had to do some rigging to move it. Using a combination of chainfalls, sleds, chains, and rollers, he moved the tank out of the pumphouse without breaking a sweat. After a lot of searching, we found the slit that was leaking. Unfortunately these are not patchable. They have to hold 120 psi while expanding and contracting constantly so they have to be in one piece. We had to consult with a few experienced pump contractors to figure out the manufacturer. After calling the manufacturer, we determined a replacement bladder is available. 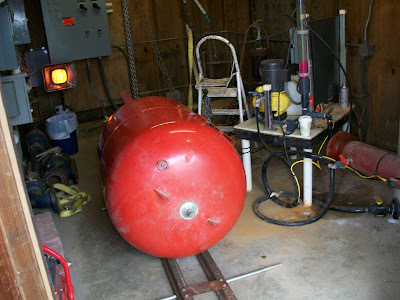 Now we have the option to replace the bladder and rebuild this tank instead of buying a whole new tank. Neither option is exactly "cheap" but the mystery has been solved!